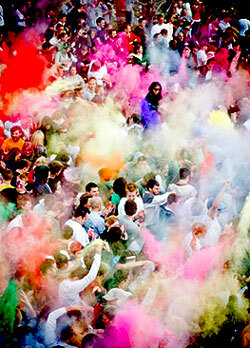 Holi is the Festival of Colors, a traditional Indian holiday celebrated in our own innovative fashion. By far our biggest festival of the year, during Holi 2010 thousands of revelers flooded the temple and grounds for a day of brightly colored powder, mantra, music and a bit of “holi” mayhem. There will be musical interludes, the lighting of a bonfire, burning of an effigy, and the throwing of dry colors on friend and foe alike. This year, realizing that Holi has developed a national following especially among college festival-goers, we are preparing more parking and more colors (by far) than ever before. The music, the dance, the worship, the facilities — everything is being upgraded for Holi 2011. In India, Holi announces the arrival of spring and the passing of winter. The festival breathes an atmosphere of social merriment. People bury their hatchets with a warm embrace and throw their worries to the wind. Every nook and corner presents a colorful sight. Young and old alike are covered with colors (red, green, yellow, blue, black and silver). People in small groups are seen singing, dancing and throwing colors on each other. 11:00 am – 12:30 pm, Namrock with TK & Nirantara with Jai Krishna Das & Govinda Dhatta, including Curt Gordon (lead guitar), Troy Peery (bass) Josh Francis (Trumpet), Dan Nelson (Saxaphone) & Shaun Thomas (drums). 7:15 pm – 8:30 pm All Star Finale: C.C. White, Larisa Stow, Prem Mayi, TK, Govinda Dhatta.